Dorothy Sexton is Macklowe Properties Senior Vice President of Sales and is leading the company’s effort for One Wall Street. 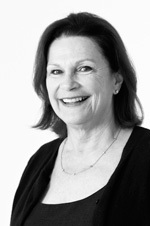 Ms. Sexton came to Macklowe from Town Residential where she was Managing Director of their 730 Fifth Avenue Office. Prior, she was an associate broker with Sotheby’s International Realty. She has been Vice President and Sales Director to successful condominium projects including Windsor Park at 100 West 58th Street, 25 Broad Street, Downtown by Philippe Stark and Arris Lofts to name a few. Her experience includes marketing and sales management from the pre-development stage thru CPS-1, presale and closings. Previous to Ms. Sexton’s career in Real Estate, she was a successful general management executive in luxury consumer products with emphasis in beauty care and cosmetics. She has worked with companies such as Revlon, Circle of Beauty and Del Laboratories. Ms. Sexton is a member of REBNY ‘s Membership Committee. She holds an MBA from The Wharton School of the University of Pennsylvania.